A Less-Invasive Way to Replace a Heart Valve: Is Newer Better? A nonsurgical method to replace the aortic valve turned out as safe as surgery and allowed more patients to go home from the hospital, rather than to a nursing home or rehabilitation facility. Susan Strong was 49 when she had her aortic valve replaced in 2014. Strong, a middle school teacher, had aortic valve disease, which typically affects older adults. It gave her fatigue, palpitations, chest pressure, and shortness of breath. Untreated, it can cause heart failure and other life-threatening problems. The study reported in the Journal of the American College of Cardiology that for at least a year after both procedures, people experienced similar health outcomes. But compared with people who opted for surgery, patients who chose the nonsurgical procedure that Strong did were able to leave the hospital more quickly and were more likely to go home, rather than to a nursing home or rehabilitation facility—an outcome Brennan’s patient partners had identified as particularly important. 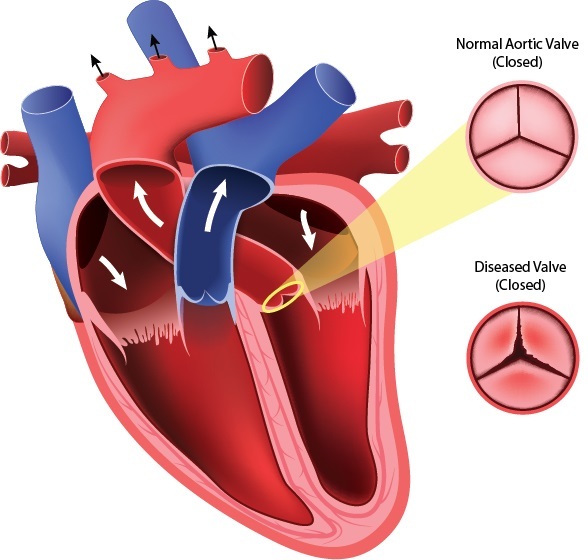 The aortic valve functions as a one-way door: It opens to allow the heart to pump blood out and closes to prevent blood from flowing back into the heart. Aortic valve disease is an alarmingly common problem. In the United States, an estimated 2.5 million people have it. Most develop it in old age. However, Strong’s aortic valve had been damaged by radiation therapy for Hodgkin’s lymphoma, a cancer of the immune system. Once the disease hits, Brennan says, half of all patients die within two years if not treated. Traditionally, treatment meant open-heart surgery, followed by days in the hospital and weeks of recovery at home. “For an older patient, it can be a very challenging experience,” Brennan says. The aortic valve controls the flow of blood between the main pumping chamber of the heart and the main artery to the body. An estimated 2.5 million Americans have aortic valve disease, in which the valve hardens and doesn’t open and close properly. Then, in 2011, the Food and Drug Administration approved a less-invasive alternative. In transcatheter aortic valve replacement (TAVR), instead of opening the chest, doctors thread the new valve through large blood vessels to the heart. Brennan estimates that 150,000 TAVRs have been performed since then. But there’s been little research on use of the procedure in patients with multiple conditions, even though people with aortic valve disease tend to be older and have more health problems. Some researchers also have raised concerns about the long-term safety and effectiveness of TAVR. So, Brennan set out to determine which patients do best with TAVR and which might do better with surgery. It made Brennan rethink his study goals. And because patients including Strong were part of the team that planned and carried out the study, he changed the outcomes the study measured, adding discharge location—whether patients go home from the procedure or to a nursing home. The research team used data from Medicare claims from 9,464 people, all of whom were 65 or older, deemed intermediate- or high-risk patients, and eligible for either type of treatment. Half had received TAVR; the others, surgical valve replacement. Brennan’s team drew the data from databases built by the Society of Thoracic Surgeons and the American College of Cardiology. Both clinician groups served as partners on the study. As expected, compared with people who had surgery, the patients who had TAVR had shorter hospital stays: an average of four days, instead of eight. And the team reported that one year after the procedure, people did about equally well with either approach in terms of rates of death, strokes, and amount of time outside a hospital. I would love to see it down to where you would sit with your cardiologist and make decisions based on where you are in life. A limitation of the study was that it followed patients for only a year, so it can’t say how patients do over the longer term. The results largely echo the findings of previous studies that involved narrower patient populations, with fewer health concerns among participants. The nonsurgical method, says Thomas E. MacGillivray, MD, Chief of Cardiac Surgery and Thoracic Transplant at Houston Methodist Cardiovascular Surgery Associates and treasurer of The Society of Thoracic Surgeons, “allows patients to leave the hospital sooner than conventional surgery and to often go directly home rather than to a rehab or nursing home. We are hopeful that the long-term results of this procedure will show improved quality and length of life without the need for further surgeries or hospitalizations." To help guide others in choosing between the procedures, Brennan’s team has been developing a shared decision making tool. It uses a series of questions that patients answer and discuss with their doctors. It also has software that calculates a patient’s risk of death or a stroke and their likely quality of life with a new valve. The group hopes the tool will help patients use the results of the study to decide which type of aortic valve replacement is right for them. “Patients and caregivers collaborated with the researchers so the tool was more user-friendly, and people could understand the questions,” says Brenda Schawe, another patient partner in the study. Her mother and mother-in-law both underwent surgical valve replacements. Both women experienced long, difficult recoveries. “I would love to see it down to where you would sit with your cardiologist and make decisions based on where you are in life,” she says. Goal: To evaluate health outcomes of surgical versus transcatheter aortic valve replacement.